Now in its second generation, the Porsche Cayenne is better than ever. It is lighter, faster and some say, better looking than the previous version. These accolades seem to be a recurring theme with Porsche, as it seems to have the golden touch with all of its recently revamped models. Like most Porsche faithful, I was a bit dismayed when they announced in the early 2000’s, the intention to add an SUV to their lineup. Their 1st generation vehicle was a huge success, now the 2nd one is ever better, as the Cayenne really is the Porsche 911 of SUV’s! Thanks to its success, especially in the US, Porsche has been able to invest additional resources towards research and development, with stellar results. All one needs to do is look and drive a new 911, Boxter and Cayman. Enough said. The Cayenne GTS is a striking triumph to the senses. Walking up to it, you notice the distinct black wheels, the large, painted brake calipers and the subtle yet noticeable sporty front fascia, unique to the GTS and Turbo models. The rear of the Cayenne GTS offers striking quad exhaust tips, a reminder of the special 420 HP monster that’s lurking under the hood. Once inside, the symphony on the senses continues. The Cayenne GTS I drove was heavily accessorized from the Porsche option book, which included some wonderful items, such as the optional alcantara swathed steering wheel and sports seats with double contrasting stitching and red seat belts. Porsche has a knack of getting things right, the seats being a good example. Recently, I’ve had the opportunity of driving some excellent, world-class sports cars, which offer optional, racing style sports seats. These look great, but in practical terms, my thighs and “gluteus maximus” begin to complain after just 30 minutes of seat time. With the Cayenne seats, I was a happy camper, regardless of the journey’s length. Trim, fit and finish are as expected, perfect. Attention to detail is almost surgical-like. One thing we did notice is the less than intuitive infotainment system. One of the key indicators for me is if I am able to navigate through it without needing the manual. Unfortunately, after 20 minutes of pressing buttons and turning knobs, I gave up and succumbed to the manual. I am sure that with practice and regular use, it does become more user-friendly. The Cayenne has the Panamera-like sloping center console with HVAC switches flanking the gear selector; a simple design idea that works perfectly. Rear seats are comfortable for two adults, a smidge tight for three. Cargo room is generous in an elegantly appointed rear cargo hold with under floor privacy storage as well as a roll up security cover. There is a large panorama electric moon-roof that livens up the already gorgeous interior even more. Starting the Cayenne GTS is from the proper side of the dash for a Porsche, which purists insist, is the left side. A wonderful cacophony of sounds emanate from the exhaust, a tantalizing tease to the driver of what lies ahead. Selecting D on the elegant gear selector and pressing the sport button prepares the Cayenne for a sensory overload. Floor the accelerator pedal and the lucky driver is rewarded with an aural concert from the V8 engine and quad exhaust. Let off the throttle and a satisfying crackling can be heard. To test the handling capabilities of the Cayenne GTS, I hit a couple of my favorite on and off ramps around South Florida and I was rewarded with 911-like performance. Aggressive braking is simply breathtaking and the suspension can be as luxurious or as sporty as the driver’s desire. The ride is serenely quiet at highway speeds, especially with fresh tires. Need to pass someone on the highway? No sweat! The Cayenne GTS offers effortless performance, regardless of the speed. You just can’t believe you are driving an SUV! 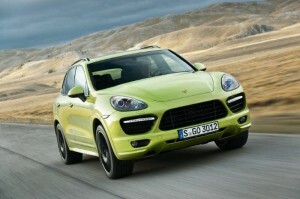 The 2013 Porsche Cayenne GTS, it really is the family sports car! Popular Options: Huge list to choose from. Such as: Interior package, Burmester premium sound, 21” painted wheels.